ages and families. The hotel offers also the chance to have a relaxing golf experience in the beautiful golf green. 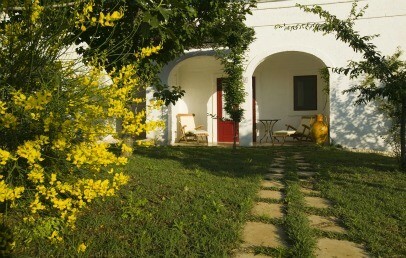 Torre Coccaro is a 16th century farmhouse, a few Km away from the sea, surrounded by olive trees, almond trees and carobs. It is 5 km away from Fasano. The tower, originarily built for defensive purposes against the Saracens excursions, is now part of an elegant 5 stars resort which keeps intact the capacity of enjoying the simple and refined pleasures of country life. In the courtyard there is still an ancient consecrated chapel of 1730. The Farmhouse disposes of a gorgeous swimming pool with beach-effect. The private beach is at 2 km. Masseria Torre Coccaro disposes of 34 rooms with garden and bathroom with bathtub, hairdryer, air conditioning, mini bar, telephone, sat TV, internet access, safe, linen sheets, feather pillows, olive oil soap and shampoo, newspaper in the room, bathrobe and towelling slippers. These rooms provide a large bathroom with bathtub, a small breakfast table with two armchairs, and are equipped with painted pieces of furniture which keep the traditional motifs of Apulian Farmhouse. 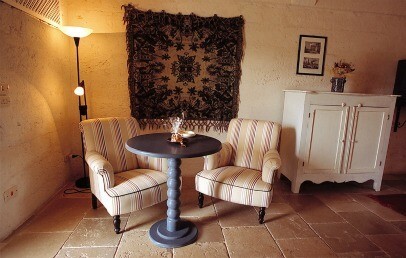 Superior rooms are larger than Classic rooms and are located in the farmyard, with a small front garden. These rooms are extremely elegant and combine perfectly comfort and rural style. 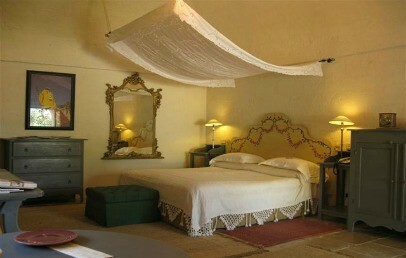 Some of the Junior Suites are located in the ancient farmyard and have a stone fireplace, others are in the ancient tower of 16th century with the typical barrel vaults and small balcony with the sea view and panoramic view over the olive trees; the other Junior Suite has been obtained from the typical tuff residences of the Farmhouse, with comfortable and elegant sofas under the typical stone vaults. 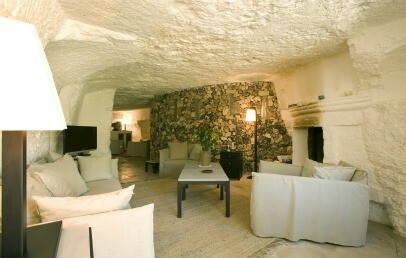 This marvellous suite is 100 sqm and has been buit in a cave. It disposes of its private orchard with age-old orange trees and a private swimming pool which has been obtained from an ancient well. 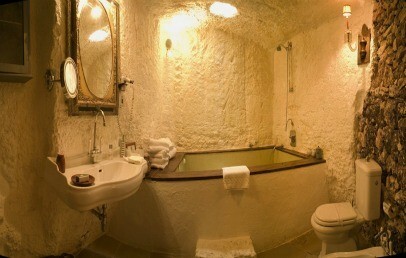 The suite disposes also of a big bathtub with whirlpool for two people and a romantic stone fireplace. The Spa of the Torre Coccaro has been built in the stone with the purpose of exalting Nature and its materials like wood and rice paper and its beauties like plants and the view over the age-old olive trees. The SPA is equipped with a gym, a heated pool, hydro massage and Turkish bath with eucalyptus oil scents. In all treatments at the SPA centre, only biological herbs and fruits are employed. The professionals of the SPA propose a choice of massages that vary from the traditional ayurvedic massage to the massage on a floating water mattress, from shiatsu to reflexology. The restaurant Egnathia, with the typical Farmhouse architecture featuring star vaults and a lovely bower, proposes the traditional dishes of the region. The biological cultivation of the vegetables, which have an incredible taste due to the fact that they grow in the fields near the sea, give the possibility to the chefs to express their Mediterranean creativity. The Coccaro Beach Club is set in a nice location: in front of the sea and of a long sandy beach with age-old dunes. In this Beach Club there is also a romantic fish restaurant open for lunch an dinner where sushi and fresh oysters are also served. In the Farmhouse there is a beautiful Driving Range and a Putting Green set among the olive trees. It is possible to take Cooking classes, and benefit from the advices of the chef and of the expert housewife to be able to prepare some of the traditional recipes of the Apulian cuisine. A riding school surrounded by the countryside not far from the sea, gives the possibility to go on horseback for a nature trail or to visit the numerous farmhouses of the area. It is also possible to ride by the beach. It is also possible to have riding classes with pony for children. Boots and caps available. Double room characterized by high ceiling, linen sheets and painted pieces of furniture which keep the traditional motifs of Apulian Farmhouse. The private bathroom is equipped with shower or bathtub, hairdryer, bathrobe and slippers and a complimentary toiletries based on olive oil fragrances. Superior rooms face a cosy terrace with campaign view. Double rooms located in the main courtyard. They are characterized by high ceiling, linen sheets and painted pieces of furniture which keep the traditional motifs of Apulian Farmhouse. They consist of a large double room and a living area equipped with easy chairs and table. The bathroom is equipped with shower or bathtub, hairdryer, bathrobe and slippers and a complimentary toiletries based on olive oil fragrances. Deluxe rooms face a private welcoming patio with garden view. Fascinating Suites which combine perfectly comfort and rural style. They consist of a large double room and a living area equipped with easy chairs and table. The Junior Suites are located in different areas of the Masseria: some are in the old courtyard with fireplace and a cosy patio; the suites set in the tower with vaulted ceilings and small, sea and olive groves view balcony. 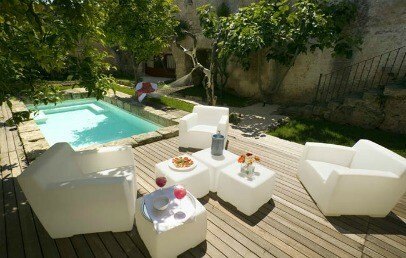 Finally, there are some spacious accommodations in the main courtyard, with high ceilings and private patio and garden. All bathroom are equipped with shower or bathtub, hairdryer, bathrobe and slippers and a complimentary toiletries based on olive oil fragrances. Romantic Suites which combine perfectly comfort and rural style. 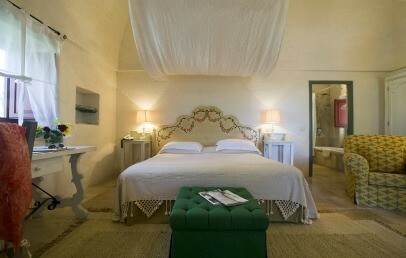 The Junior Suites Deluxe are located in different areas of the Masseria: two of them are in the Tower and enjoy a panoramic view of the campaign, olive groves and sea; the last Suite is set in the Bianca cave and presents a charming fireplace and a private garden of 80 sqm with sun beds. The bathrooms are equipped with Jacuzzi bathtub, hairdryer, bathrobe and slippers and a complimentary toiletries based on olive oil fragrances. 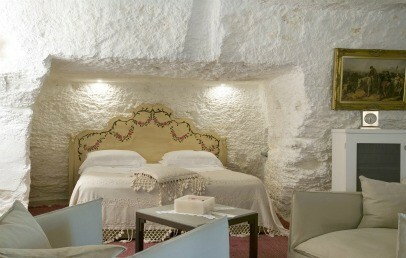 Exclusive Suites located in a white cave. 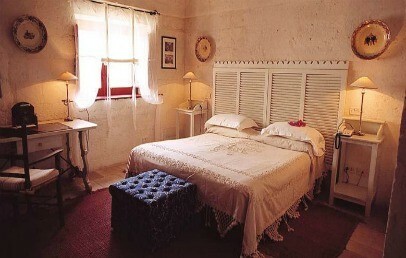 It consists of a large double room with rock fireplace and living area. The bathrooms are equipped with 2 places Jacuzzi bathtub, hairdryer, bathrobe and slippers and a complimentary toiletries based on olive oil fragrances. 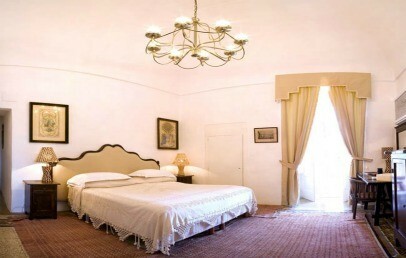 The Suite is dipped in a private garden (200 sqm) of age-old orange trees with heated swimming, obtained from an ancient well.